A basic knowledge of the signs and symptoms of acute spinal cord dysfunction are required in order to perform a relevant history and physical examination. A spinal sensory level is classically found, but sensory complaints and findings limited to the distal extremities can also be seen early in the course of spinal infarction. Typically onset is apoplectic, evolving in minutes or a few hours to produce severe dysfuction of sensory and motor systems. Occlusive vascular lesions affecting the spinal cord (spinal stroke) are diagnostic challenges. As is the case for the more common cerebrovascular accident affecting cerebral circulation, an acute onset is a clue to the diagnosis. The circulation to the spinal cord has unique features related to the rich anastomotic anatomy of the cord that result in relative rarity of spinal cord infarction in comparison to cerebral infarction, as described in the images below. Transverse section of spinal cord showing location of main pathways. 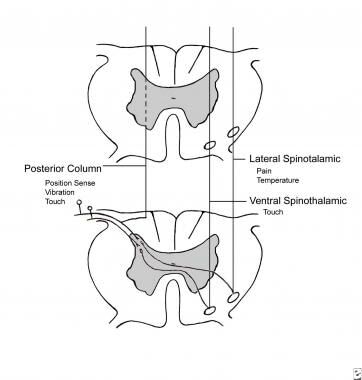 The lamination of fibers in posterior columns and in lateral spinothalamic and lateral corticospinal tracts is indicated (C, cervical; T, thoracic; L, lumbar; S, sacral). Simplified representation of course of major sensory pathways in the spinal cord. 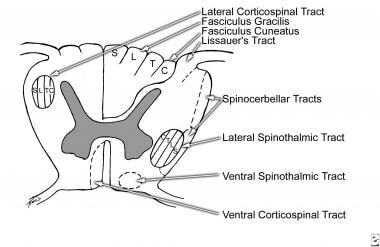 Decussation of the spinothalamic tracts occurs within one or two segments of their entry. 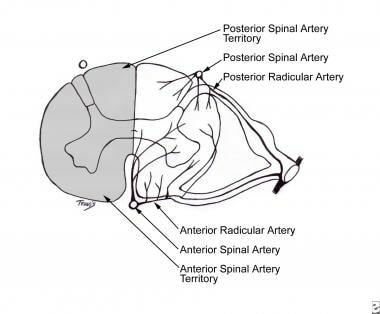 Pattern of arterial supply to spinal cord and (left) territories of the anterior and posterior spinal arteries. The anterior spinal artery is a single long anastomotic channel that lies at the mouth of the anterior central sulcus and supplies the circulation to the anterior two thirds of the spinal cord, shown below. It gives origin to sulcal arteries that take an arching course to one or the other anterior gray horns. The posterior spinal arteries are smaller paired arteries lying just medial to the dorsal roots. The arterial supply of the spinal cord arises from the aorta and at its cephalad and caudal ends from tributaries of the subclavian and iliac arteries. Eight to ten unpaired anterior medullary arteries are branches of the larger afferent aorta and vertebral and iliac arteries. The largest anterior medullary artery, the great anterior medullary artery of Adamkiewicz, which is susceptible to occlusion with neurologic deficit, is located at the lumbar enlargement, usually at L2 on the left side (but may be at any point from T8 to L2). Spinal cord infarction is not common, but only fragmentary or indirect data are available on incidence or prevalence. A large study showed that only 9 of 3784 autopsies revealed spinal cord infarction, with a rate of occurrence of 0.23% at death. Conversely, if spinal stroke is approximately 1.2% of strokes, an overall annual incidence of 12 in 100,000 can be estimated. International incidences are also unclear. Recent reports that describe patients developing spinal cord infarction in an increasing number of situations and pathologies would influence this because procedures ranging from major surgery to injections for epidural anesthesia, infections and especially meningitis, and medications vary in different countries. The risk to life and its quality from spinal cord infarction is substantial because of the disability, which can be severe, with paraplegia, risk of pulmonary emboli, and risk of infection (eg, bladder, lungs, decubiti). However, no epidemiologic studies are available because of the relatively small number of patients affected. Published series of reports of spinal cord infarction are relatively small, ranging up to 36-44 patients. They find a mortality rate in the vicinity of 20-25% for patients admitted to hospital with spinal cord infarction. No relationship to age is reported. However, the reported series do have a median age of 52 years. Although prognosis is guarded, with many or most patients remaining severely weak and with with severe bladder dysfunction, up to one-third to one-half of patients experience slow recovery of at least a moderate nature. Cheshire WP, Santos CC, Massey EW, Howard JF Jr. Spinal cord infarction: etiology and outcome. Neurology. 1996 Aug. 47(2):321-30. [Medline]. Salvador de la Barrera S, Barca-Buyo A, Montoto-Marques A. Spinal cord infarction: prognosis and recovery in a series of 36 patients. Spinal Cord. 2001 Oct. 39(10):520-5. [Medline]. Combarros O, Vadillo A, Gutierrez-Perez R. Cervical spinal cord infarction simulating myocardial infarction. Eur Neurol. 2002. 47(3):185-6. [Medline]. Weber P, Vogel T, Bitterling H, Utzschneider S, von Schulze Pellengahr C, Birkenmaier C. Spinal cord infarction after operative stabilisation of the thoracic spine in a patient with tuberculous spondylodiscitis and sickle cell trait. Spine. 2009 Apr 15. 34(8):E294-7. [Medline]. Joseph G, Santosh C, Marimuthu R. Spinal cord infarction due to a self-inflicted needle stick injury. Spinal Cord. 2004 Nov. 42(11):655-8. [Medline]. Hogan EL, Romanul FC. Spinal cord infarction occurring during insertion of aortic graft. Neurology. 1966 Jan. 16(1):67-74. [Medline]. Ross RT. Spinal cord infarction in disease and surgery of the aorta. Can J Neurol Sci. 1985 Nov. 12(4):289-95. [Medline]. Faivre A, Bonnel S, Leyral G, Gisserot O, Alla P, Valance J. [Essential thrombocythemia presenting as spinal cord infarction.]. Presse Med. 2009 Apr 22. [Medline]. Lyders EM, Morris PP. A Case of Spinal Cord Infarction Following Lumbar Transforaminal Epidural Steroid Injection: MR Imaging and Angiographic Findings. AJNR Am J Neuroradiol. 2009 Apr 15. [Medline]. Zhang J, Huan Y, Qian Y. Multishot diffusion-weighted imaging features in spinal cord infarction. J Spinal Disord Tech. 2005 Jun. 18(3):277-82. [Medline]. Vijayan N, Peacock JH. Spinal cord infarction during use of zolmitriptan: a case report. Headache. 2000 Jan. 40(1):57-60. [Medline]. Sandson TA, Friedman JH. Spinal cord infarction. Report of 8 cases and review of the literature. Medicine (Baltimore). 1989 Sep. 68(5):282-92. [Medline]. Satran R. Spinal cord infarction. Stroke. 1988 Apr. 19(4):529-32. [Medline]. Lee SH, Kim SB, Choi SG, Lim YJ. Paraplegia due to Spinal Cord Infarction After Lifting Heavy Objects. J Korean Neurosurg Soc. 2008 Feb. 43(2):114-6. [Medline]. [Full Text]. Tosi L, Rigoli G, Beltramello A. Fibrocartilaginous embolism of the spinal cord: a clinical and pathogenetic reconsideration. J Neurol Neurosurg Psychiatry. 1996 Jan. 60(1):55-60. [Medline]. [Full Text]. Weidauer S, Nichtweiss M, Lanfermann H. Spinal cord infarction: MR imaging and clinical features in 16 cases. Neuroradiology. 2002 Oct. 44(10):851-7. [Medline]. Luo CB, Chang FC, Teng MM. Magnetic resonance imaging as a guide in the diagnosis and follow-up of spinal cord infarction. J Chin Med Assoc. 2003 Feb. 66(2):89-95. [Medline]. KÃ¼ker W, Weller M, Klose U. Diffusion-weighted MRI of spinal cord infarction--high resolution imaging and time course of diffusion abnormality. J Neurol. 2004 Jul. 251(7):818-24. [Medline]. Shinoyama M, Takahashi T, Shimizu H. Spinal cord infarction demonstrated by diffusion-weighted magnetic resonance imaging. J Clin Neurosci. 2005 May. 12(4):466-8. [Medline]. Thomas T, Branson HM, Verhey LH, Shroff M, Stephens D, Magalhaes S, et al. The Demographic, Clinical, and Magnetic Resonance Imaging (MRI) Featuresof Transverse Myelitis in Children. J Child Neurol. 2012;27:11-21. 1. 27:11-21. [Full Text]. Robertson CE, Brown RD Jr, Wijdicks EF, Rabinstein AA. Recovery after spinal cord infarcts: Long-term outcome in 115 patients. Neurology. 2012 Jan 10. 78(2):114-21. [Medline]. Castro-Moure F, Kupsky W, Goshgarian HG. Pathophysiological classification of human spinal cord ischemia. J Spinal Cord Med. 1997 Jan. 20(1):74-87. [Medline]. Cheng MY, Lyu RK, Chang YJ, Chen CM, Chen ST, Wai YY, et al. Concomitant spinal cord and vertebral body infarction is highly associated with aortic pathology: a clinical and magnetic resonance imaging study. J Neurol. 2009 Apr 28. [Medline]. Cheshire WP Jr. Spinal cord infarction mimicking angina pectoris. Mayo Clin Proc. 2000 Nov. 75(11):1197-9. [Medline]. Cunningham JN. Spinal cord ischemia. Semin Thorac Cardiovasc Surg. 1973. 10:3-5. Di Chiro G, Herdt JR. Angiographic demonstration of spinal cord arterial occlusion in postradiation myelomalacia. Radiology. 1973 Feb. 106(2):317-9. [Medline]. Garland H, Greenberg J, Harriman DG. Infarction of the spinal cord. Brain. 1966 Dec. 89(4):645-62. [Medline]. Gass A, Back T, Behrens S, Maras A. MRI of spinal cord infarction. Neurology. 2000 Jun 13. 54(11):2195. [Medline]. Hogan EL, Dale AJD. Disorders of the spinal cord. In: Clinical Medicine. Vol 10. 1982:1-36. Laguna J, Cravioto H. Spinal cord infarction secondary to occlusion of the anterior spinal artery. Arch Neurol. 1973 Feb. 28(2):134-6. [Medline]. Leite I, Monteiro L. Spinal cord infarction. Neurology. 1997 May. 48(5):1478. [Medline]. Wheeler HB, O'Donnell JA, Anderson FA. Bedside screening for venous thrombosis using occlusive impedance phlebography. Angiology. 1975 Feb. 26(2):199-210. [Medline]. Young G, Krohn KA, Packer RJ. Prothrombin G20210A mutation in a child with spinal cord infarction. J Pediatr. 1999 Jun. 134(6):777-9. [Medline]. Guide to clinical determination of the segmental spinal cord level. Transverse section of spinal cord at T12-L1 showing infarction of central cord. The patient became paraplegic following resection of a ruptured abdominal aortic aneurysm. During surgery, prolonged occlusion of the abdominal aorta and great anterior radicular artery was necessary.